Welcome to the 55" Miss Shirley Hydro page. Here are a few pictures of the boat on the water. 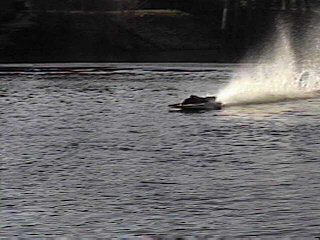 The boat runs good and I will be working to get the speed up. More pictures of the boat on the water are coming soon!. Front view of the 26 lb 55" Warehouse Hobbies Hydro. 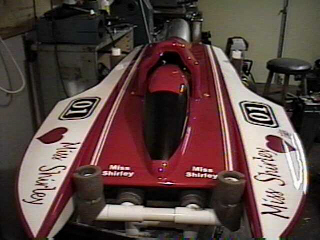 Side view of the Miss Shirley Hydro. This is a shot of the Hardware. The Boat is powered by a 32cc QuickDraw with a pipe. Here is a shot of the turn fin. Here is a shot of the stuffing tube. Another shot of the stuffing tube setup. Here is a picture of the boat stand. I will be adding more pictures and also a mpeg (.avi) of the boat on the water.